than doing what I most love. I do my work for the love of it. And when I am paid and someone takes it away it is always difficult, but gratifying. It means someone loved it, and it supports the creation of more work. Since I wrote my last post I have been traveling, traveling, traveling. Thirty four miles hiking in the Grand Canyon, among other adventures. More on that later. Now I’m in Old town Alexandria, Virginia. I’m a visiting artist for the month of July. Looking in to the studio from the hallway- my workspace is in the back, gallery space in the front. After all the mind expanding adventures, it’s particularly wonderful to settle down in the studio and get some work done. I’m ensconsed in my studio, creating a new reality within the confines of my canvas. 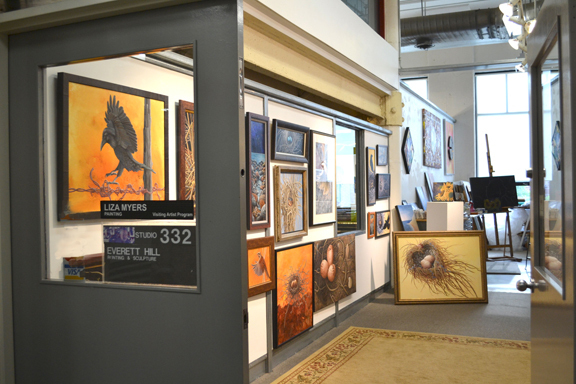 The space is long and narrow with a display space in front and work space in back. Both are quite adequate, airy, bright and cool despite the sweltering heat outside. This year’s artists were selected by juror F. Lennox Campello, international award-winning artist, curator, consultant, and widely published art critic and writer in Washington, DC and Philadelphia, PA. He is often heard on NPR and the Voice of America discussing visual art issues. Mr. Campello also authors one of the Internet’s seminal and leading arts blogs. So make a beeline across the Potomac from Washington DC to Old Town Alexandria. 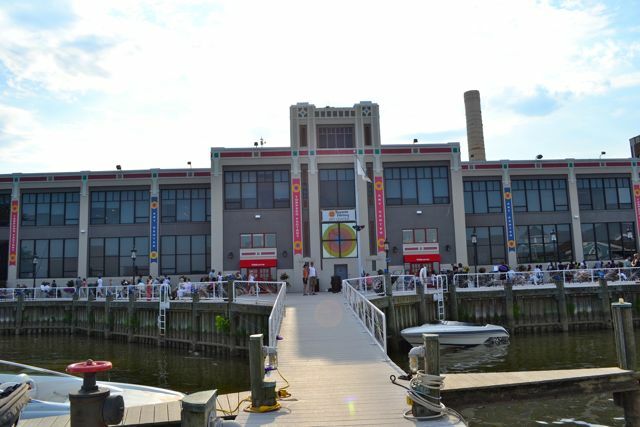 The Torpedo Factory Art Center feature more than 100 artists at work. They are exploring every medium imaginable and some you might not have thought of! I started this here last week. Georgia O'Keeffe and Carlos Castañeda are watching over my shoulder. 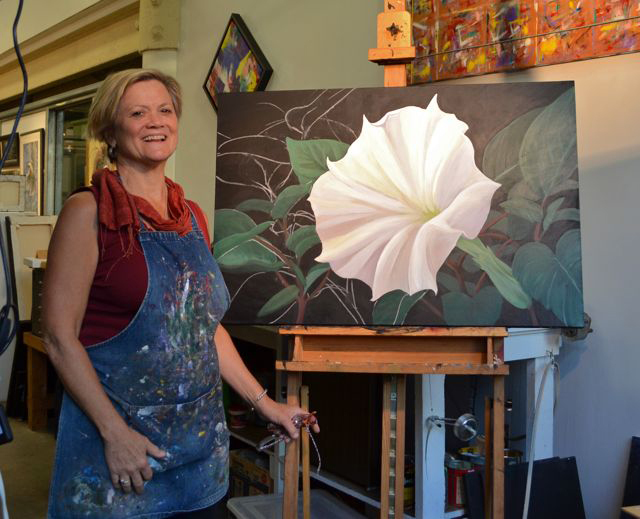 It took me a long time to be able to paint Jimson weed because O'Keeffe had done it so marvelously. But I grow them in my garden, and find them in the desert. They're mine too. I haven’t explored the Torpedo Factory completely yet because I’m WORKING. Reveling in time with paint and canvas. It’s also wonderful to meet the many art enthusiasts who find their way here. So far I’ve had visitors from 10 states and 5 different countries. Very interesting! Tomorrow night there is an opening for the visiting artists. C’mon down! I really wish Larry Morris had been there the day I went. I absolutely loved his minimalist sculptures made out of welded steel. The big cyclist sculpture in the front of his studio with the geometrical pyramid head and red scarf was great! They really reminded me of the spy vs. spy comic strip and is probably why I loved them all so much. Georgia would be proud, I’m sure Liza 🙂 It’s stunning! Have paintbrush, will travel…Aren’t you glad you’re a painter and not a boat builder? I love the torpedo factory! Congratulations on your status as visiting artist there! « LEAVE! GO AWAY! Get OUT OF HERE!! !